Offline version provided by -Auron- / JrMasterModelBuilder / Gatanui. 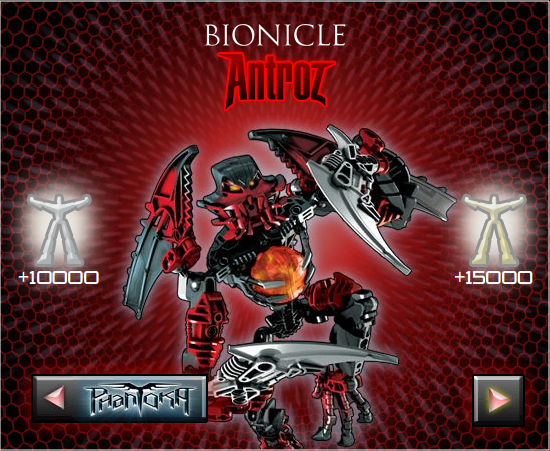 The Battle for Power - Makuta games focused on the three Phantoka Makuta Vamprah, Antroz, Chirox and their allies light-drained Av-Matoran. 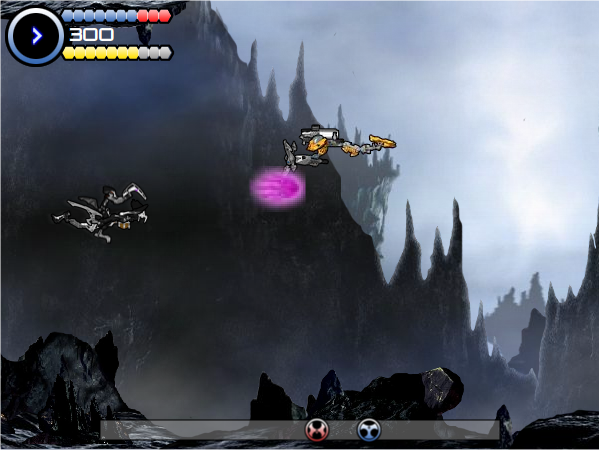 Vamprah: Identical in gameplay to the Pohatu game, the player plays through five levels. 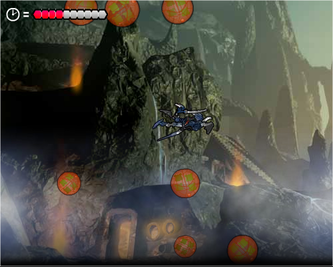 Each level is made up of two parts: In the first part, the player has to collect as many Tridax pods as possible in a short, limited period of time. In the second part, the player flies through the cave of Karda Nui defeating the Toa Nuva along the way, and preventing them from teaming up with Av-Matoran which will make them even harder to defeat. 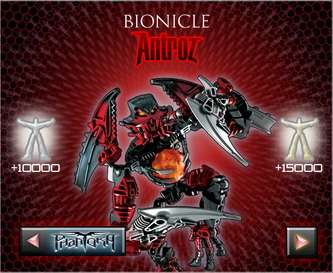 The number of Toa Nuva per level increases with each level. Silver award B.I.O. Code: AVG825. Gold award B.I.O. Code: PRA628. Codes increase speed, rate of fire and time to complete first part of a level by ten seconds. Antroz: Taking control of Antroz and Radiak, the player steers Radiak, who is followed by Antroz, through a Stalactite Village. The player has to fire Tridax pods of different colours at the corresponding villages draining the Av-Matoran' light and as such turning them into allies. 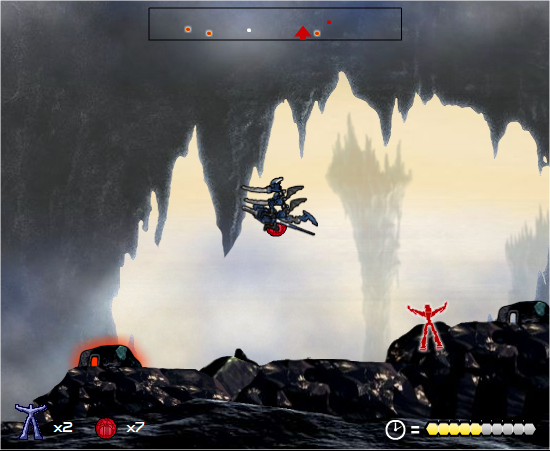 In later levels, all of which have to be completed in five minutes, flying Av-Matoran will appear who the player has either to avoid or drain their light by firing bombs over them. Silver award B.I.O. Code: AID732. Gold award B.I.O. Code: NRZ981. Codes attach Radiak to Antroz' back, thus making them easier to steer, and enhance speed and agility, plus defeating any enemy by touching them. 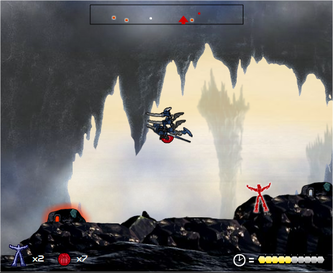 Chirox: With a similar gameplay to the Tanma game, the player controls Chirox and Kirop, who have to pursue and finally defeat a fleeing Av-Matoran upon reaching him. 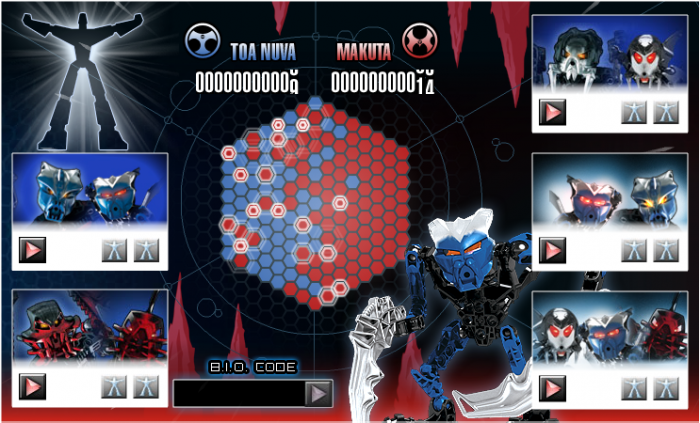 During the game, Toa Nuva and Makuta (with and without Matoran) appear, which the player has either to avoid, or in case of the Toa Nuva, defeat. 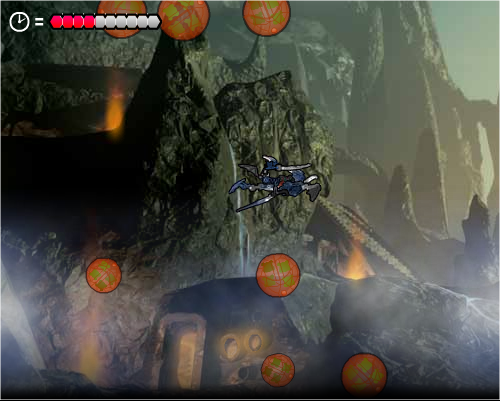 The player also has to avoid touching the ceiling/floor of the cave. 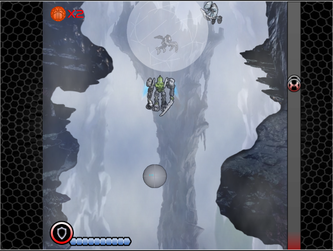 Two power-ups appear in the game, one increasing speed and one increasing health. Silver award B.I.O. Code: OIP492. Gold award B.I.O. Code: XHO369. Codes increase the power of Chirox's attacks. 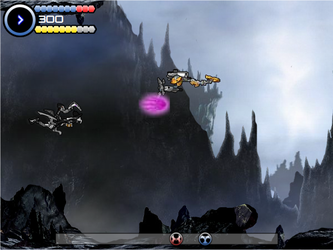 Gavla: With a similar gameplay to the Antroz game, the player takes control of Vamprah and Gavla, steering them through a Stalactite Village. The player has to fire Tridax pods at the villages draining the Av-Matoran' light and as such turning them into allies. In order to get the respective color's Tridax Pod they have to shoot at the corresponding villages, the player has to find the light-drained Av-Matoran that throws the Pods in the air and catch them. Only one color Tridax Pod can be collected at a time. Silver award B.I.O. Code: BIO639. Gold award B.I.O. Code: BIO224. Codes increase the number of Tridax Pods of one colour that can be collected at a time. 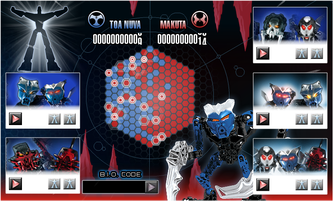 Shadow Matoran: This game, identical to that of the Av-Matoran, features all six Matoran sets. The player plays with all three light-drained Av-Matoran once, thus there are three levels. The goal is to get the Matoran safely to the Swamp of Secrets first before the Av-Matoran enemy, collecting Tridax pods on the way and avoiding obstacles like the walls, the Toa Nuva or the Makuta or the enemy spheres. Silver award B.I.O. Code: BIO502. Gold award B.I.O. Code: BIO376. 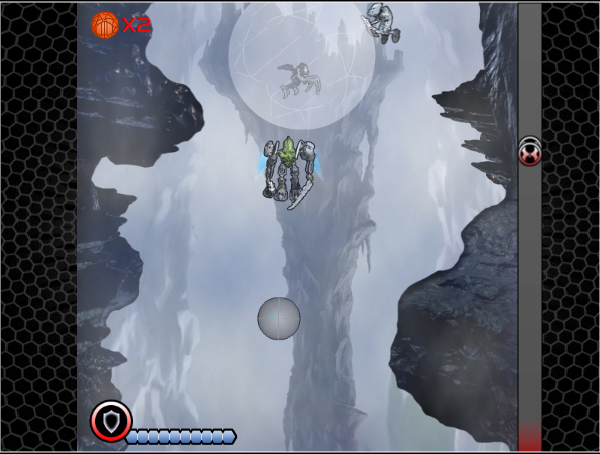 Codes unlock two-player mode and increase damage resistance. Controls (Vamprah): Keyboard (Arrow keys, Space). Controls (Antroz): Mouse, Keyboard (Arrow keys with the exception of Down). Controls (Chirox): Keyboard (Arrow keys with the exception of Left and Right, Space). Controls (Gavla): Mouse, Keyboard (Up). Controls (Light-drained Av-Matoran): Keyboard (Arrow keys with the exception of Down, Space, Two-player: 1,2,3). Requirements: Return to Battle for Power (2008).